We all lead such busy lives now, juggling work, home life, children, exercise, eating well, keeping up with the latest fashions; it doesn’t leave much time for nails does it? Or does it? 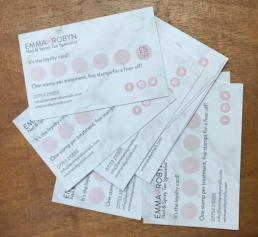 Here we have a hot line to Emma Robyn Nails, a mobile nail technician who has also recently openend a new studio at the home ground of Dulwich Hamlet Football Club (did you hear that wonderful news too? ), anyway, I digress. Emma Robyn specialises in Manicures, Pedicures and Spray Tans and is a local mum so what’s not to love about keeping it local? To coincide with the launch of Emma Robyn Nails Loyalty Card, Emma is offering our clients £5.00 off your first treatment at home or at her studio, just quote ”The Canape Queen” when you book. It will make her smile and guarantee your discount! You will also be eligible for her Loyalty Scheme, which means that every time you visit, you collect a stamp and when the card is completed you will receive £5.00 off your next treatment PLUS £5.00 off a seat at one of our East Dulwich Supper Clubs boked within the same year.